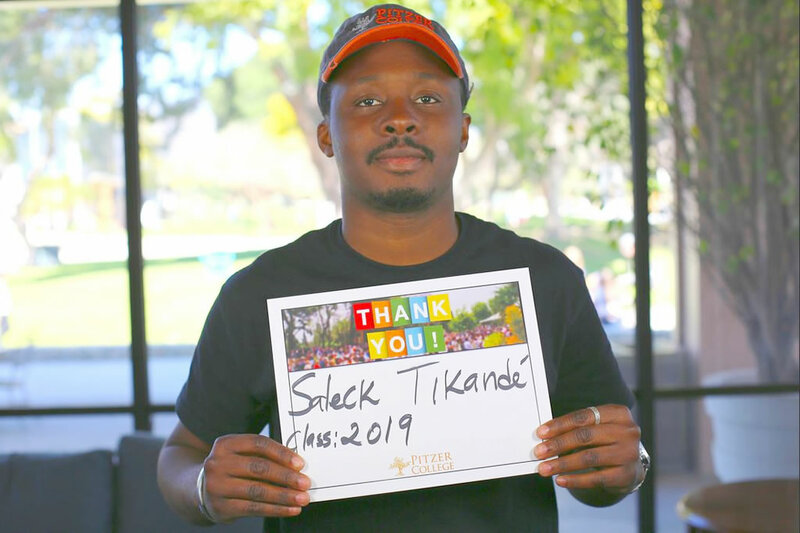 Saleck Tikande '19 says Thank You! Endowed gifts allow Pitzer to operate with assured financial security and give donors the personal satisfaction of knowing they have made a permanent and lasting contribution to a world-class institution, the students we serve and the faculty who teach and inspire them. We are profoundly grateful to the alumni, parents, trustees, foundations and other friends of the College who have established the following endowed funds at Pitzer that enable us to offer unique and exceptional opportunities to our students and faculty in perpetuity. For additional information about endowed funds at Pitzer College or to make a gift to a named endowed fund, please contact the Office of Advancement at 909.621.8130 or giving@pitzer.edu. The Agnes Moreland Jackson Diversity Program Endowed Fund was established in 2006 by a generous gift from Pitzer alumna and former trustee Quinn Delaney ’76 and her husband, Wayne Jordan. Delaney earned a degree in art history from Pitzer in 1976 and served as a trustee from 1991 to 1994. In 2000, she and her husband founded the Akonadi Foundation whose mission is to support and nurture a racial justice movement that can finally put an end to the structural racism that lies at the heart of social inequity in the US. Delaney serves as president of the Foundation. Prof. Agnes Moreland Jackson was the first tenure-track African American professor at Pitzer and was instrumental in establishing the Black Studies and Women’s Studies Departments for The Claremont Colleges. The Agnes Moreland Jackson Diversity Program Endowed Fund provides support for programs and activities primarily directed toward first-year students but that are open to all. The theme and content of each event is meant to advance Pitzer’s core values of diversity and intercultural understanding. The fund is administered by Pitzer’s Campus Life Committee, which annually reviews submitted proposals and recommendations from members of the College community and determines how to best disperse the funds. Events and programs supported by the endowment include field trips, workshops, guest presentations, conferences, films, concerts and lectures. The Ahmanson-Davis Honnold Library Endowed Book Fund was established in 1990 through a challenge grant offered by the Arthur Vining Davis Foundation, with a one-for-two matching grant made by The Ahmanson Foundation. Funds contribute annually to The Claremont Colleges Library (formerly known as the Honnold/Mudd Library) materials budget, helping the Library to substantially increase the level of acquisitions funding, monitor new technologies for information delivery, review serial subscriptions and provide seed money to upgrade the current holdings in academic specializations of new faculty, among other activities of significant impact. Throughout her lifetime, Ann E. Pitzer, Pitzer College trustee and granddaughter of the College’s founder, supported a wide variety of initiatives, projects and programs that positively and deeply affected students, faculty and others within the Pitzer community. Her service to Pitzer College was exemplary, and in a final demonstration of her deep-rooted affection for Pitzer College and her unwavering belief in its mission, she established the Ann E. Pitzer Endowed Directorship of International Programs through a bequest made in her living trust shortly before she passed away in 2014. Ms. Pitzer held a longstanding belief in the value of learning about other cultures, and this fund will support in perpetuity the top leadership position overseeing Pitzer’s thriving study abroad and international programs. Established in 1983, the Arthur Vining Davis Foundation Faculty Fellowships in the Humanities Endowed Fund was established to broaden the base of intellectual endeavor and allow faculty to tackle new problems and assess the solutions their research will uncover, not only for themselves, but for their students. The summer stipends allow faculty to continue ongoing research or to begin new projects and are awarded by Pitzer College’s research and awards committee. Pitzer alumna Bea Hollfelder ’87, along with her husband, Tom Hollfelder, established the Bea Matas Hollfelder ’87 Endowed Creative Writing Award in 1994. Ms. Hollfelder grew up in East LA and entered Pitzer College as a New Resources student in 1984, graduating in 1987 with a bachelor’s degree in English and world literature. Managed by the Office of the Dean of Faculty at Pitzer College, at least one student is selected annually for the award by a Faculty Selection Committee comprised of tenure-line English and world literature (EWL) faculty. Students selected for this honor must be majoring in EWL, any track, and have demonstrated a long-term commitment to English, world literature, creative writing, poetry or combined course of study in these subjects. Awardees may be a sophomore, junior or senior. The award is not limited to students needing financial aid. To be eligible, students must submit a personal statement detailing their commitment to the field of creative writing, poetry and/or literature in the future as well as a writing sample that best represents their passion and talent. Longtime Pitzer friends Carol and Sam Tanenbaum established the Carol and Sam Tanenbaum Pitzer Science Research Prizes Endowed fund in 2014 to support the research work of students in the life and physical sciences. The prizes are to be awarded annually to two Pitzer students by the Keck Science Department, with each award initially set at $250. The prizes will be awarded for work done on either a senior thesis or a team project, with each student making a substantial contribution to a problem of interest to a significant number of people. Nomination for the awards shall be solicited from all faculty members supervising research done by Keck Science students. The Catherine Blore ’02 Endowed Memorial Book Fund was established in 2002 with a lead gift from Alan Jones and Jennifer Berkley. Prof. Jones served as Pitzer’s dean of faculty from 2001 to 2012 after joining the staff of Pitzer College in 1986 as a professor of neuroscience and psychology. Jennifer Berkley served in Pitzer’s Office of the President as the associate vice president/secretary to the board of trustees. In conjunction with their seed gift, they offered a matching challenge that generated contributions to the fund from many donors wishing to honor Catherine’s memory: Catherine died in 2002 just a few months before completing her undergraduate degree at Pitzer. This special endowed fund honors Catherine’s academic efforts and the impact she made on Pitzer. When Catherine became ill, she asked that the credit she had left at Huntley Bookstore go to a New Resources student with financial need. In response to this generosity toward students in Pitzer’s New Resources program, Jones and Berkley specified that this endowed fund provide monetary assistance to New Resources students with financial need to offset the cost of their books. Pitzer’s New Resources program was designed to bring the small, liberal arts college experience to students of non-traditional college age (25 years of age or older). The Celebration of Jewish Culture Endowed Fund was established in 2004 by Pitzer College alumnae Deborah Bach Kallick ’78 and Alissa Roston ’78, P’06. Kallick and Roston were classmates and close friends during their time at Pitzer. Kallick was elected to Pitzer’s Board of Trustees in 1988 and become an emerita member in 2015; Roston was elected to the Board in 2010 and is still an active member. Annual spendable income from this fund is used to sponsor events and programs that celebrate the rich and vibrant heritage of the Jewish culture and further interfaith communication at Pitzer, across The Claremont Colleges and within the world-at-large. The fund is administered by the Pitzer College Office of Student Affairs through the Jewish Cultural Life Committee (JCLC) whose membership is primarily composed of Jewish students attending Pitzer. The Committee collaborates with Hillel of The Claremont Colleges, an organization that serves the spiritual, cultural and social needs of Jewish students, and the Jewish Chaplain for The Claremont Colleges to plan and execute relevant engagement opportunities. Ellis and Ann (Compton) Stephens established the Compton Foundation Visiting Fellows Endowed Fund in 1981 through the generosity of the Compton Foundation. Mrs. Stephens’ daughter, Rebecca DiDomenico ’81, graduated from Pitzer College in 1981 and now serves as president of the Foundation. The Fund was created for the purpose of bringing to the Pitzer campus distinguished and interesting individuals who are admirably and passionately engaged in world affairs. Visiting speakers hail from a diversity of fields, including art, politics, education, business and research. Wishing to honor their daughter, Deborah Bach Kallick ’78, and acknowledge her outstanding experience at Pitzer College as well as her service to the College, Michael and Sulana Chait established the Deborah Bach Kallick Fund for Commencement Speakers in 1989, which, in 1994, became the D.B. Kallick Community Service Endowed Fund. A longtime Pitzer College trustee, Kallick joined the Board of Trustees in 1988 and was honored with emerita status in 2015. The D.B. Kallick Community Service Endowed Fund supports the execution of community service projects, providing financial assistance to Pitzer students engaged in service to others through community-based agencies. Ideal recipients of Kallick Community Service funds will have contributed at least 100 hours of service over a 10-to-12-week period. Other criteria considered when selecting recipients include the depth and breadth of the service opportunity, the variety of tasks and responsibilities within the project and whether the project provides the student valuable life and career experiences. Pitzer’s Community Education Center selects the annual awardees. The David Ken Schoell Endowed Memorial Award was established to honor David Schoell, a theater arts major at Pitzer College who died in a car accident in 1981 while still a student. David was remembered as an exceptional student and, therefore, this award is given annually to a student of The Claremont Colleges with a declared theatre design major whose design work in sets, costumes and/or lighting has shown the highest standards of excellence. The recipients are selected by the design faculty at the Theatre Department of Pomona College. The David Sadava Endowed Scholarship was established in 2013 by Pitzer College alumnus and trustee Shahan Soghikian ’80 and his wife, Camilla Soghikian. While a student at Pitzer College, Mr. Soghikian took biology, biochemistry and genetics courses with Prof. Sadava in his pursuit of a biology degree and was profoundly influence by him. Prof. Sadava is the Emeritus Pritzker Professor of Biology at the Keck Science Department of Claremont McKenna, Pitzer and Scripps Colleges. He joined the faculty of The Claremont Colleges in 1972 and retired from teaching in 2009. Mr. Soghikian has served as a Pitzer College trustee since 2005 and currently serves as chair of the board of trustees. The David Sadava Endowed Scholarship is awarded annually to deserving Pitzer College students whose academic and career aspirations emulate the spirit of Dr. Sadava’s life work and contributions in biomedical science, particularly in the treatment of cancer and other human diseases. Eligible students must be a junior or senior with a GPA of 3.5 or higher; have demonstrated financial need; have an academic concentration in biology; and have demonstrated a strong career and/or research interest in medicine or related field focusing on human health, such as neuroscience, human biology, chemistry or biochemistry. Selection of the scholar will be managed by the Office of Financial Aid in consultation with the Dean of Faculty and/or other knowledgeable science faculty. The Distinguished Scientist Endowed Lecture Series was established in 2014 by an anonymous donor to bring prominent speakers in the sciences to the Pitzer campus on an annual basis for the edification of the Pitzer community, The Claremont Colleges community and members of the general public. The Doman Faculty Fellowships in the Social Sciences Endowed Fund at Pitzer College was established in 1979 by longtime Pitzer College Trustee Nicholas R. Doman. He was first elected to the Board of Trustees in 1975, the year his son, Daniel B. Doman ’75, graduated from Pitzer. Elise G. Mead and the Giles W. and Elise G. Mead Foundation. The fund supports faculty who provide writing instruction to students and helps Pitzer recruit and retain world-class faculty members. Resources from this fund also strengthen the College’s ability to maintain a low student-to-faculty ratio. Established in 2006, the Endowed Fund for Media Studies helps augment Pitzer’s media studies department by supporting a variety of media studies-related activities, including course enhancement/curriculum support, film festivals and the visitation of distinguished guests and leading thinkers in media to Pitzer’s campus. Pitzer College thanks Thomas Curley, former president and CEO of The Associated Press, for establishing this fund that enriches the media studies program at Pitzer College and, by extension, enhances the academic strength of Intercollegiate Media Studies (IMS) at The Claremont Colleges. IMS is an interdisciplinary program that investigates social histories, cultural contexts, theoretical approaches and technologies of media forms. Within IMS, production is oriented toward independent narrative forms, documentary, video and digital art and community-based and activist media. The Eugene and Estelle Ferkauf Foundation was established in 1967 by the founders of the retail chain E.J. Korvette. Funds from this endowment are used to support faculty salaries. Established in 1971, the Frederick J. Salathé Endowed Fund for Music and the Cultural Arts supports an event or series of events related to the arts, music and /or literature as practiced, exhibited or performed by professionals. Funds are awarded by Pitzer’s Campus Life Committee. The Friends of Luke Rogers International Programs Endowed Fund was established in 2009 by Pitzer parents Lam and Dieu-Anh Nguyen-Phuong P’11 in memory of Pitzer student Luke Rogers ’11, the roommate of their son, Chi-Linh “Jeremy” Nguyen-Phuong ’11. The spirit of the fund recognizes Luke’s passion for the international study opportunities offered through Pitzer’s unique and thriving study abroad program. In 2008, Luke Rogers lost his life in a boating accident at age 19, shortly after the beginning of his sophomore year at Pitzer. He was known for his dazzling smile, his gentle spirit, his compassion and his talents as a visual and performing artist. While at Pitzer, he enjoyed singing with The Claremont Colleges a cappella group, The Shades. The Friends of Luke Rogers International Programs Endowed Fund helps support lower- and middle-income international students coming to Pitzer from developing countries as well as Pitzer students who are studying abroad in developing countries. Established in 1978, The Giles W. and Elise G. Mead Endowed Writing Fund provides general budget support for “educational purposes related to the concise, precise and effective use of the English language,” as set forth in the 1980 Elise G. Mead Endowment Agreement. With a generous gift received from the estate of Elise G. Mead, the Pitzer College Board of Trustees established this endowed fund. Administered by the vice president for academic affairs and dean of faculty at Pitzer in conjunction with English and world literature faculty, the fund’s resources support the College’s creative writing program and the salary of an annual visiting writer. The Gottlieb External Studies Endowed Fund was established in 2006 with a generous pledge of support made by Pitzer College alumnus James “Tokyo Jim” Gottlieb ’83. Originally named the Tokyo Jim International and Intercultural Endowment Fund, this fund was created to support the most pressing needs in international and intercultural education at Pitzer College. The Harvey Botwin Endowment for Economics was established by Pitzer College Alumna and Trustee of the College Tracy Tindle ’82. Tindle was instrumental in rallying alumni, faculty, staff, and friends of the College to contribute to this special fund that honors longtime faculty member Harvey Botwin who retired in 2007 after 40 years of teaching and inspiring eager minds. The Pitzer community was saddened by the passing away of Prof. Botwin in 2015. Pitzer is enormously grateful for the endowment, which is dedicated to enhancing the senior-year experience for students studying economics. It helps bring influential speakers to campus for the edification of economics students, defrays costs related to senior thesis research and senior seminar activities, covers expenses associated with membership in an economics honor society and provides unique social experiences for students and faculty in the economics field group. Hired in 1967, Prof. Botwin helped create the economics and political studies field groups and taught courses that integrated the two subjects, as well as sociology and philosophy, thus augmenting the College’s interdisciplinary focus. For four decades, he made a deep impression on his students and colleagues and became one of Pitzer’s most legendary faculty members. Known for his impassioned economics lectures—as well as his outrageous wardrobe—he transformed the complex subject of economics into one that was accessible and exciting. The Hecker Endowed Community Fellowship was originally established in 1984 as the Hecker Family Endowed Teaching Fund with a generous pledge of support made by Harvard and Patricia Hecker P’76. In 2014, it was renamed and re-designated to support a community fellowship. Patricia Hecker is an emerita trustee of Pitzer College. This fund underwrites an annual Hecker Community Fellow, selected and managed by the Office of the Dean of Faculty. This post-baccalaureate appointment, generally awarded for one or two years, is a full-time, salaried position that carries some component of community engagement. Becoming a Hecker Community Fellow is highly competitive and an esteemed honor. Generally, the Hecker Community Fellow will be tasked with academic and managerial responsibilities according to the needs of the position. This may include academic support; facilitating community engagement; conducting research and coordinating scholarly lectures and events; working as a liaison between community engagement projects and Pitzer student interns; and service on campus committees. The International Endowed Student Internship Fund was established by Trustee Steven Chang ’83 and Pitzer Parent Miranda Kwok P’15, mother of Matthew Kwok ’15, to award a deserving Pitzer students whose academic and career aspirations involve working internationally, with preference given to students who wish to work in Asia. For this purpose, Asia includes but is not limited to the countries Afghanistan, Bahrain, Bangladesh, Bhutan, Brunei, Cambodia, China, East Timor, India, Indonesia, Iran, Iraq, Israel, Japan, Jordan, South Korea, Kuwait, Kyrgyzstan, Laos, Lebanon, Malaysia, Maldives, Mongolia, Myanmar, Nepal, Oman, Pakistan, Palestine, Philippines, Qatar, Saudi Arabia, Singapore, Sri Lanka, Syria, Taiwan, Tajikistan, Turkmenistan, United Arab Emirates, Uzbekistan, Vietnam and Yemen. The award provides funds to support travel expenses, rent and living expenses, proper professional attire and other related costs which can be significantly higher for students working internationally. Eligible students must be a first-year, sophomore or junior at Pitzer with a GPA of 3.0 or higher and have identified a strong career and/or research interest in Asia or another country outside of the United States. Students will be selected by the Office of Career Services. The Jill Ford Harmon ’66 Faculty and Student Endowed Research Fellowship was established in 2007 with an unrestricted bequest gift from the estate of Jill Ford Harmon. The fund supports a faculty/student summer research project, and awardees are selected annually by the Office of the Dean of Faculty. Jill Ford Harmon ’66 graduated from Pitzer College in 1966 with a degree in general studies. Her death in 2005 was a loss that saddened the entire Pitzer community. She was the first alumna to join the Pitzer College Board of Trustees, and she served as a class representative for the inauguration of Pitzer’s fifth president, Laura Skandera Trombley. Brinda Sarathy, director of the Robert Redford Conservancy for Southern California Sustainability at Pitzer College, worked with John “Jack” Sullivan’s widow, Jacqueline Levering Sullivan, to establish the John. D. Sullivan Memorial Endowed Fund in honor of Prof. Sullivan following his passing. Prof. Sullivan passed away in 2014. Inspired by his commitment to water issues, the fund will provide support for activities such as public lectures on water issues, student research and internships related to water and public policy, water-related workshops and field trips for faculty and students. The John R. Rodman Arboretum Endowed Fund was established by many generous donors, including Gwen Rodman, widow of the late John R. Rodman, a former and much-admired professor of political and environmental studies at Pitzer; Patricia Hecker, a Pitzer College emerita trustee, and her late husband, Harvard Hecker, the parents of Pitzer alumnus Bruce Hecker ’76; members of Pitzer’s faculty and staff; and numerous others. The John R. Rodman Arboretum Endowed Fund helps maintain and preserve the environmentally responsible flora growing throughout the entire Pitzer campus, largely made up of California natives and drought-tolerant plants. The fund also helps ensure the Arboretum’s future as an educational resource, as many disciplines rely upon the Arboretum as a hands-on learning tool, including art, anthropology, environmental studies and even political studies. Students play a key role in the care of the Arboretum. In addition to its educational purposes, the Arboretum provides the Pitzer community, the broader Claremont Colleges community and the general public a beautiful respite. The Pitzer College Arboretum began on campus in 1984 as a movement led by Professor Rodman to preserve indigenous vegetation on campus. Originally a sub-section of Pitzer’s grounds, the College has expanded the Arboretum’s boundaries to encompass the entire campus. Over time, this has meant increased and improved record-keeping, mapping, data management and, of course, the addition and maintenance of a larger selection of flora. The family and friends of Katie Lawson ’73 created the Katie Lawson Endowed Memorial Award in 1973 in honor of Katie, who tragically lost her life only a year after graduating from Pitzer. The fund was established to foster the kind of independent study or external study experience that was such an important part of Katie’s involvement while a psychology student at Pitzer. It was a concern of Katie’s that other Pitzer students might not have the opportunity to conduct field work similar to what she was able to do, for lack of transportation or funds. She was also concerned that students might not be in a position to develop more personal or innovative projects on their own. With Katie’s caring nature in mind, this fund was created to honor and perpetuate her values and to help students get the most out of their Pitzer experience. Financial assistance provided by the fund empowers and enables students, particularly psychology majors, to pursue their social work or community service objectives. The donors requested that preference be given to students majoring in psychology with an interest in clinical work. The Office of the Dean of Faculty manages the Katie Lawson Endowed Memorial Award and annually selects the student awardees. Eli and Edythe Broad P’78, whose son attended Pitzer College in the late 70s, made a generous gift in 2003 in support of the Pitzer College endowment. This investment in the endowment plays a critical role in the College’s success, because as a college’s endowment grows, so does its ability to transform visionary ideas into life-changing and world-changing actions. The Keck Joint Science Program Endowed Fund was created in 1983 following a gift from the W.M. Keck Foundation to Claremont McKenna College, Scripps College and Pitzer College establishing an endowment for the Joint Science Program. Funds are used annually to help support this important program. The Laura Skandera Trombley Humanities and Arts Research and Internship Fund was established during the 2014–15 academic year to honor then-President Laura Skandera Trombley’s service to Pitzer. Skandera Trombley departed Pitzer College June 30, 2015 to become the first female president of The Huntington Library, Art Collections and Botanical Gardens. She requested that any funds given in honor of her 13-year presidency be given to this endowment. Alumni, parents, trustees, faculty, staff and friends of the College generously contributed to the fund in its inaugural year. The fund supports Pitzer College students involved in the humanities and arts by providing financial support for research projects and internships related to the subjects former President Trombley fervently championed: literature, philosophy, history, religion and the arts. Students will work directly and solely with humanities and arts faculty in their research projects and internships. Up to three awards may be made during a given year, with award consideration beginning at the start of the spring semester. The Awarding Committee, comprised of the vice president for academic affairs and dean of faculty as well as faculty representatives from the aforementioned areas, will review and adjust the amount of each award to align with similarly prestigious awards given by the College. All full-time, matriculating students are eligible for the award, and awardees will be announced at the end of the spring semester. The Mosbacher Endowed Fund for Media Studies was established in 2010 through a generous gift by Pitzer College alumna Diane Mosbacher ’72. In 1972, Dr. Mosbacher graduated from Pitzer with a degree in psychology, followed by completion of a PhD in social psychology from Union Graduate School and an MD from Baylor College of Medicine in 1983. In 1991, she was the first graduate of Pitzer to serve as the College’s commencement speaker. The Mosbacher Endowed Fund for Media Studies helps support Pitzer College Media Studies activities such as guest speaker series, workshops, film/video festivals, faculty/student research projects and community outreach programs. The fund was established to broaden students’ understanding of the impact that media has on addressing social justice and LGBTQ issues. Established in 2007, the Murray Pepper and Vicki Reynolds Pepper Distinguished Visiting Artists and Scholars Endowed Fund at Pitzer College helps bring critically-acclaimed artists and scholars to campus. These remarkable visitors add vibrant texture to the fabric of our campus through their seminars, hands-on workshops, public talks and one-on-one conversations with students, faculty and The Claremont Colleges community. Annual resources generated by this fund may be used to support the visitor’s honorarium, travel, housing and material expenses. Through providing financial assistance to students, the Pitzer College Endowed Internship Fund supports students’ participation in unpaid internships to foster career exploration and build upon their academic studies. This valuable fund enables students to seize these important opportunities that connect their classroom learning with practical, real-world experience without the financial burden associated with the internship (housing, travel, living expenses, appropriate attire, etc.). Internships offer far-reaching benefits for students, including giving them opportunities to test hypothetical career choices, identify their strengths and passions, sample work environments, be involved in the community, develop more realistic expectations about the professional world, increase their desirability to graduate schools, network with professionals in their field and enhance their employability. Internships are one of the best competitive advantages that a college student can secure. Pitzer is grateful to the donors who support the Endowed Internship Fund, which enhances the College’s ability to offer individualized attention to students’ career goals, thereby helping them fulfill their potential. The President’s Fund for Excellence allows access to resources to seize opportunities and support initiatives that celebrate the values of Pitzer College: community, diversity, dialogue, inquiry and action. All gifts to this fund enable the College’s president to launch special initiatives, meet pressing needs as they arise and capitalize on emerging opportunities to strengthen academic and student life programs. Established in 1983, the Printed Word Endowed Fund supports activities focused on literacy and writing. The fund enables Pitzer College to invite to campus distinguished and fascinating authors, poets or other individuals working and creating in fields related to literacy and writing. They are invited to Pitzer as visiting lecturers, teachers and classroom participants to share their expertise and insight with faculty, students and staff. Besides authors and poets, Printed Word visitors may include those involved in a broader variety of professional pursuits concerning the printed word, including book dealers, book collectors, curators of special collections, publishers and artists. The Printed Word Endowed Fund is administered by the Campus Life Committee at Pitzer College, which allocates resources for special events, activities, programs and projects that serve to enhance campus life, whether in an academic or extracurricular manner or in a combination of the two. In 2003, Pitzer alumna and former trustee Quinn Delaney ’76 and her husband, Wayne Jordan, fulfilled a generous pledge of support to the Pitzer College endowment. This investment in Pitzer plays a critical role in the College’s success, because as a college’s endowment grows, so does its ability to transform visionary ideas into life-changing and world-changing actions. Quinn Delaney earned a degree in art history from Pitzer in 1976 and served as a trustee from 1991 to 1994. Following her time at Pitzer, she received a law degree from the University of Houston in 1980. The Raymond G. Marshall Internship Program Endowed Fund was established in 1985 with generous gifts from former Pitzer College Trustee Raymond G. Marshall P’92 and Emeritus Trustee Richard J. Riordan. The late Mr. Marshall, a philanthropist and restaurateur, was the father of Pitzer alumnus John F. Marshall ’92 who currently serves as director of the Marshall Charitable Trust. Upon establishing the fund, the founders declined to specify exactly how funds should be used, leaving this decision to college officials. The Marshall Internship fund supports the operating costs of the College’s Office of Career Services’ internship program, which provides opportunities for students to connect their classroom learning with practical, real-world experience. Suzanne Sheets ’68 who established a gift annuity in honor of her mother, Ruth Cohen Dolphin. Ms. Sheets spent 12 years on the Pitzer College Office of Advancement staff. This endowed fund helps maintain and preserve the environmentally responsible flora growing throughout the entire Pitzer campus, largely made up of indigenous and drought-tolerant plants. The fund also helps ensure the Arboretum’s future as an educational resource, as many disciplines rely upon the Arboretum as a hands-on learning tool, including art, anthropology, environmental studies and even political studies. Students play a key role in the care of the Arboretum. In addition to its educational purposes, the Arboretum provides the Pitzer community, the broader Claremont Colleges community and the general public a beautiful respite. The Scott Family Endowed Fund provides a Scott Global Adventure Award to one or more Pitzer College students each year who are enrolled in the Study Abroad Program. The Award allows students the ability to pursue a personal interest that would enhance their study abroad experience. For example, a side trip to explore a culturally-significant site that would otherwise not be possible due to financial reasons. The amount per award is flexible depending on need and available to students either in advance, or during, their time abroad. The application process and distribution of available funds are managed by the Pitzer College Office of Study Abroad and International Programs. The Stephen and Sandra Glass Humanities Lecture Endowed Fund was established in 2004 through the generosity of alumna Nancy Bushnell ’69 and her husband, the late David Bushnell, who died in 2005 at age 91. Ms. Bushnell graduated from Pitzer College in 1969 with a humanities degree, and she served as a Pitzer College trustee from 1987 to 2007. Emeritus Professor Stephen Glass is a founding faculty member of Pitzer College and former John A. McCarthy Professor of Classics. He and his wife, Dr. Sandra Glass, were vital partners in the creation of the Pitzer College campus and in the mentoring of Pitzer students. Known for their stimulating conversation and also as great thinkers in the humanities, this named lecture permanently links the immeasurable contributions of Steve and Sandy Glass to the history of Pitzer College. The Glass Humanities Lecture Endowed Fund underwrites the cost to bring leading scholars in the humanities to Pitzer College. Selected annually by the Office of the Dean of Faculty, these visiting lecturers add vibrant texture to the fabric of campus life through their intellectual and social interactions with our students, faculty and The Claremont Colleges community. Yearly income from this fund primarily supports a public lecture and reception, and is used to cover the visitor’s honorarium, travel, housing and related entertainment and material expenses. The Stephen I. and Connie L. Zetterberg Endowed Grove House Fund was established in 1998 with a generous gift from Alan Zetterberg who grew up in the home before it was relocated to the Pitzer College campus in 1977. Alan Zetterberg is the son of Stephen and Connie Zetterberg. Annual spendable income from this endowment is used to support maintenance and repairs of the Grove House on the Pitzer College campus. The fund makes a tremendous impact on the College’s ability to maintain the Grove House, a historic and beloved place on campus that plays a significant and meaningful role in the lives of students, faculty, staff and other members of the Pitzer community. Originally built on Harrison Avenue in Claremont in 1902 as the residence of a citrus grower, the home was purchased in 1930 by the members of the Zetterberg family who generously donated the house to Pitzer decades later. With efforts led by Professor Barry Sanders and Pitzer students, the charming home was relocated to the Pitzer campus. It became the first student cultural center at the College and, 35 years later, remains the touchstone of the campus. Restored and furnished in a manner appropriate to its American Arts and Crafts Movement heritage, the Grove House is an inviting space for socializing, studying, writing, musical performances, poetry readings, art exhibitions and delicious meals prepared with citrus and herbs grown on the land surrounding it. The essence of the house has always been hospitality and congeniality, and the upstairs guest room has accommodated visiting parents, alumni, faculty and friends of the College. The Vicke Selk Endowment for Global Comparative Studies in Art, Music and the Humanities was established in 2008 by numerous donors upon the retirement of Vicke Selk after 37 years of dedicated service to Pitzer College. Selk retired as the vice president for administration and treasurer after working in various capacities, from secretary to chief financial officer. She worked with four of Pitzer’s presidents. Arriving in 1971, eight years after Pitzer’s founding, Selk’s contributions to the welfare and future of the institution have been selfless and enormous in their positive impact. Upon her retirement, 100 percent of the Pitzer College Board of Trustees as well as numerous emeriti trustees contributed to the Vicke Selk Endowment for Global Comparative Studies in Art, Music and the Humanities, which supports the development of a more profound understanding of the causes and impacts of significant global phenomena and helps incorporate global dimensions of local community issues into curriculum. The fund is used to support Pitzer faculty as well as visiting experts in carrying out paired course global-local projects in art, music or the humanities. Specifically, funds may be used to defray expenses such as faculty and student travel, housing and meals, additional summer staff time and operations, instructional supplies and visiting faculty stipends.